Description: Thallus to 30 cms or more in length, compressed with midrib, alternately branched with short branchlets notched at the apices. 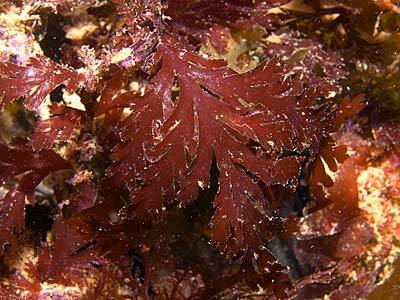 The thallus is tough, cartilaginous and dark brownish to deep purple in colour. Habitat: Common in the north. 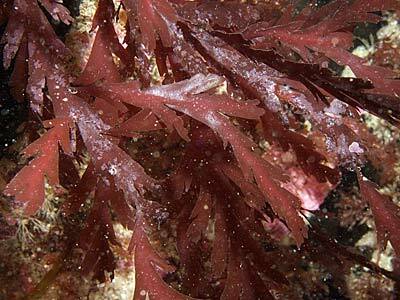 Epilithic and occasionally on stipes of Laminaria. Low littoral rock pools and sublittoral at 20 m.
Distribution: Clearly of northern distribution. In the British Isles recorded from Scotland, north-east England, north of Ireland and Isle of Man. Europe: Baltic Sea, Faroes, Spitzbergen and Iceland. Greenland. Atlantic coast of North America: Canada. Further afield: Arctic Sea including Hudson Strait and Baffin Bay. Flattened with midrib and regularly alternately notched. Morton, O. & Picton, B.E. (2016). Odonthalia dentata (Linnaeus) Lyngbye. [In] Encyclopedia of Marine Life of Britain and Ireland.